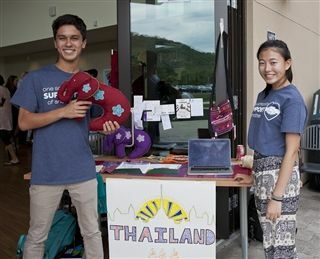 On June 9th, the Pacific Ridge community had the opportunity to learn more about this year's amazing global travel experiences during Global Rewind. In Community Hall, juniors and seniors manned tables displaying artifacts collected during the trips, and shared anecdotes and reflections from their time completing service work, immersing themselves in cultures and exploring landmarks around the world. In two of the campus reading rooms, slideshows exhibited photographs captured on the 7th - 10th grade trips to the Santa Monica Mountains, Williamsburg, China and the Northern Sierras. Thank you to our students and faculty for participating in the travel program, accepting in equal measure the challenges and joys that travel brings, and for embracing the opportunity to learn more about yourselves, others and the world.